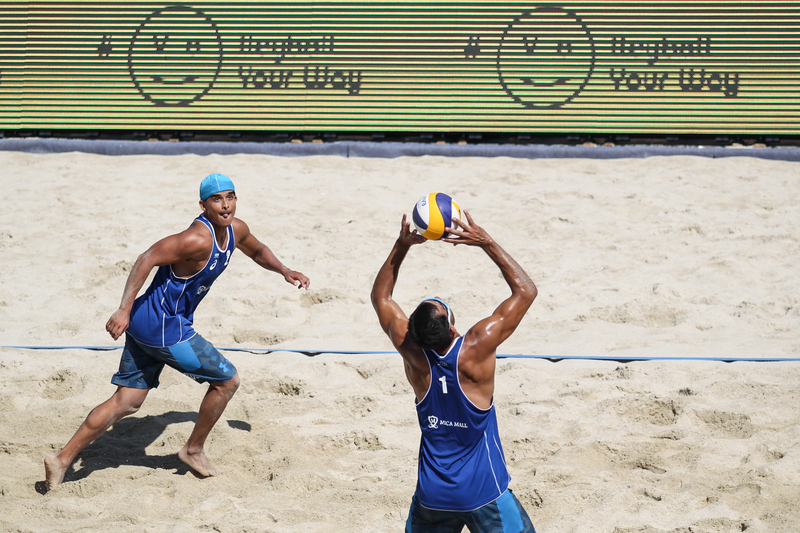 Kish Island, Iran, February 18, 2016 – Lombardo Ontiveros and Juan Virgen have certainly enjoyed the past few years as they established themselves on the FIVB Beach Volleyball World Tour and now the pair are aiming to continue their rise as the 2015-16 gets back underway. Currently Mexico's leading pair are a long way from home, nearly 14,000 kilometres to be precise, at the Kish Island Open where they were knocked out by Qatar’s Cherif Younousse and Jefferson Santos at the quarterfinal stage. Nonetheless, such has been their progress over the past two seasons that it would come as little surprise to see them back on the podium soon. Their breakthrough came at the end of 2014 when they won bronze in front of their home fans at the Puerto Vallarta Open and they added a second World Tour medal in 2015 when they claimed silver at the Antalya Open. They also won gold at the Toronto 2015, Pan-American Games and bronze at the NORCECA Continental Championships. It is a partnership that is founded on Ontiveros and Virgen pushing each other hard on court, but remaining friends off it. “He is a very tough guy, he challenges you to do things better so that is good for me,” Ontiveros said. “Off the court he is a great friend and I couldn’t be any happier right now. Underpinning their growing success is the support of the Mexican Volleyball Federation. Over the past few seasons the Federation has supported the Puerto Vallarta Open and established a National Beach Volleyball Tour on some of the most famous of Mexico’s numerous beaches, including Cancun and Acapulco. It means that Mexico’s players are able to experience playing at the top level of the sport and develop their skills in a competitive domestic environment. “It is super important,” the 32-year-old Ontiveros added. “The younger players can see a good level of beach volleyball and they need to see it to plant some objective for their futures in beach volleyball. Ontiveros and Virgen’s success has begun to garner headlines in Mexico. 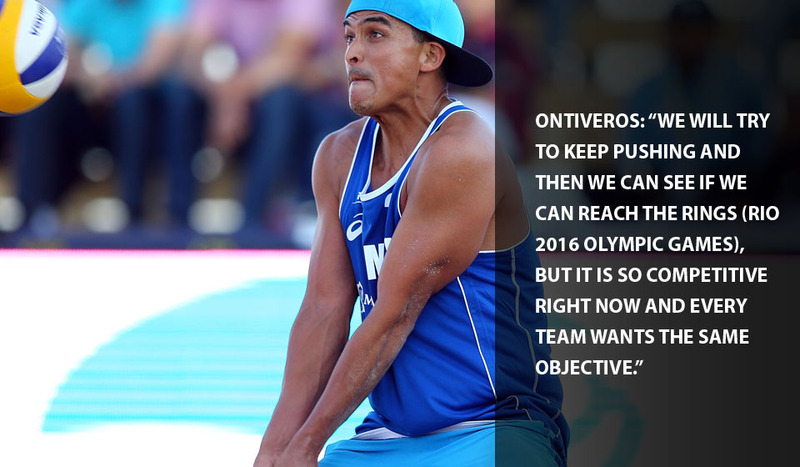 Football is a clear favourite among the public and press, with basketball, baseball and volleyball following in the nation’s affections, but Ontiveros believes that beach volleyball is next in line. The pair both enjoyed success at age-group level; Ontiveros reached the 2003 U21 World Championships quarterfinals alongside Erik Rojo, the same year Virgen finished fourth at the U19 World Championships in tandem with Michel Mokondoko. During their rise through the rankings both have played alongside Ontiveros’ younger brother Ulises, but since teaming up in 2013 Ontiveros and Virgen quickly began winning NORCECA Tour medals and now that they have started doing the same on the World Tour, there is no end to the limit of their ambitions. “People have started talking about us, but we have tried to not think so much about it and instead focused on other objectives,” Ontiveros said. “Sometimes things go well, sometimes they don’t, but it was a pretty good year last year and we have to try to forget it and do better.